The 21st of April is a special day for women in Indonesia as we celebrate Indonesian Women’s Day. The name Hari Kartini (the day of Kartini) derived from a female hero, Raden Ajeng Kartini who fought for women’s rights and educations in the era when women were not yet treated equally. 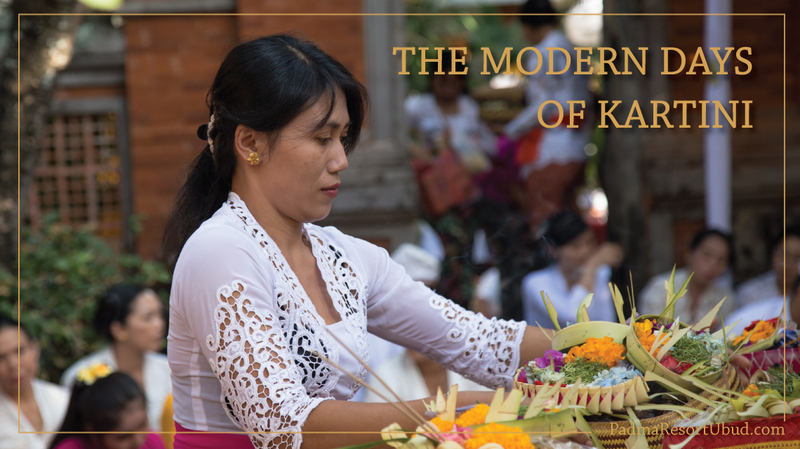 Born in an aristocratic traditional family in Java, Kartini attended a Dutch school in which she aspired to further her education though the option was unavailable for her and Indonesian women in the conservative Javanese society back in the days. Kartini then wrote a letter expressing her feelings and views of the social conditions prevailing at that time that was later published on a Dutch magazine titled Habis Gelap Terbitlah Terang (Out of Darkness to Light). Kartini continued to bring women emancipation to “light” and her birthday is now celebrated as the national Women’s Day of Indonesia, commemorating the continuous journey of women equality through various activities, traditions and events. Close to or on the day of Kartini, in major big cities and islands, you will come across school children dressed in traditional outfits of various regions in Indonesia. This has been passed on from generation to generation to celebrate the diversity of our beloved country, in the spirit of Hari Kartini. Now that the kids have their outfit ready, here comes the parade both girls and boys take part in. Some schools would go all out and perform a drum band as they walk around the city. 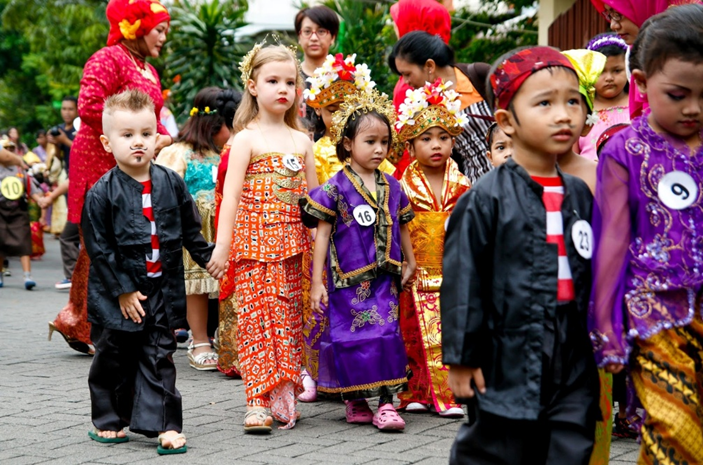 By doing this parade, we are teaching the little ones to be proud of their cultural roots, and to be able to perform in total confidence in public. Kartini Day is indeed a big festivity in Indonesia that there’s a special anthem dedicated to this day, called Ibu Kita Kartini (Our mother, Kartini). This song is sung on the day of Kartini in many places as a form of appreciation. The flag raising ceremony has a very profound meaning in Indonesia as it is normally held on big days such as Independence Day, National Hero Day, and Pancasila Day. And since Kartini is regarded as one of Indonesia’s heroes, a special ceremony is to be conducted on the day, though it is not mandatory. 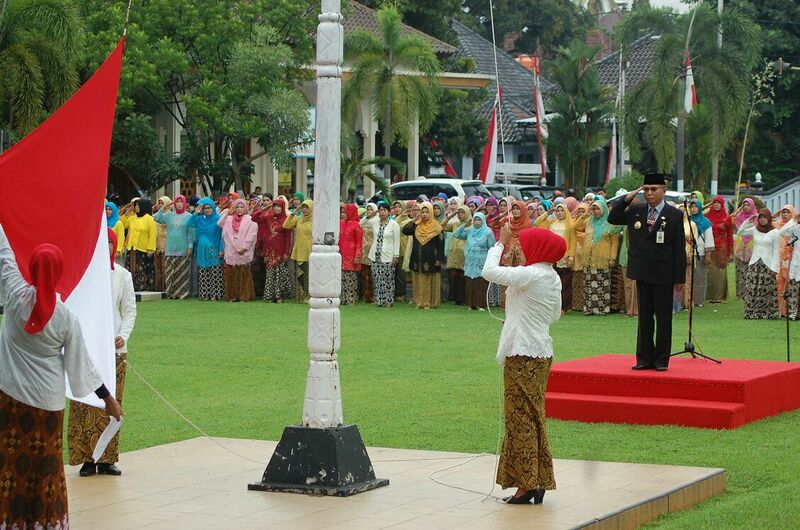 What’s unique about Kartini flag raising ceremony is that all the female participants, including the officer and inspector of the ceremony would all wear Kebaya.